Physiographic Region – an area of land with similar terrain, rock types, and geologic history. 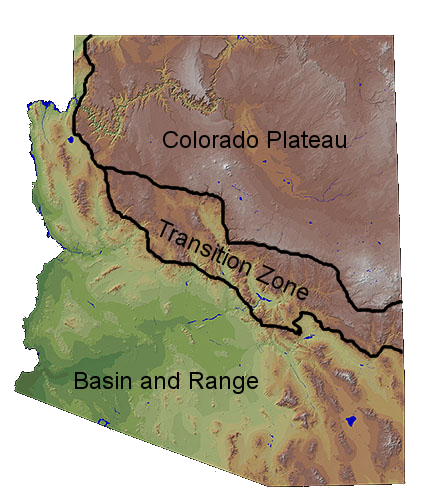 Colorado Plateau, Basin and Range Province, and Transition Zone. The Colorado Plateau is a semi-arid, mostly flat region ranging from 5,000 to 8,000 feet (1,524 m to 2,438 m) in elevation, covering most of northern Arizona and centered on the Four Corners. The southern edge of this plateau is defined by the Mogollon Rim, a cliff which extends 115 miles (190 km) from northern Yavapai County eastward toward the border of New Mexico. The Colorado Plateau is nicknamed “Red Rock Country” because of its brightly colored sedimentary rock. The geology of the Colorado Plateau is showcased in the canyons of the Colorado River, particularly the famous Grand Canyon, in which many rock layers are exposed. The Colorado Plateau hosts many other distinctive natural features as well, including the Meteor Crater, Petrified Forest, and Painted Desert. The Transition Zone is a northwest-trending escarpment of rugged mountainous terrain in central Arizona shaped by the intersection of the higher-level Colorado Plateau with the lower-level Basin and Range Province. The area is called the Transition Zone because it is transitional between the two regions, with some characteristics from both. The mountain ranges of the Transition Zone include the Mazatzal, Santa Maria, Sierra Ancha, and White Mountains. Because of the range of elevation within the Transition Zone, climatic conditions can vary widely over small areas. The Basin and Range Province is a region occupying the southern part of Arizona, along with a strip of land along the western part of the state. It is part of a much larger region encompassing southwestern New Mexico, western Utah, and virtually all of Nevada, and extending into northwestern Mexico. The Basin and Range is characterized by steep, linear mountain ranges alternating with wide desert plains. These mountains, particularly in the southeast corner of the state, can rise above 9,000 feet (2,700 m) and create biological “sky islands” inhabited by cool-climate plants and animals. The geology of the Basin and Range is the result of crustal extension of the North American plate. Due to the crustal extension, the area of the crust underneath the region is some of the thinnest in the world. The Basin and Range supplies nearly all of the copper mined in Arizona, and contains other minerals such as gold and silver.